Comply T-200 Isolation Tips are replacement ear tips for earbuds and in-ear earphones. These tips use heat-activated memory foam to create an excellent seal inside the ear canal for a superb fit. As a result, Comply tips are super comfortable, easing pressure on the ear canals so you can listen longer. They stay firmly but gently in place, so your earbuds stay securely seated in your ears. And best of all, that great fit also seals out external noise, improving the quality of the audio you can get out of your earbuds. In many cases, these Comply foam tips fit better, feel better, and sound better than the original tips that came with your earphones. What really sets Comply tips apart is their memory foam material. 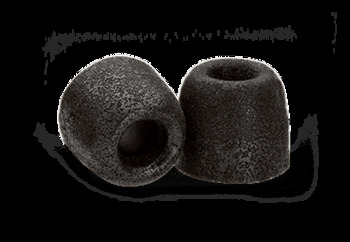 Comply Isolation 200 foam tips are actually 30x softer than a standard silicone earbud tip! Comply's special memory foam is heat-activated: after you insert the earplug tip into your ear, it softens in response to your natural body heat. As it softens, the memory foam expands to perfectly fill the ear canal, conforming to every bend and curve for an outrageously comfortable fit. The result is that you can use Comply tips to listen to the music you love for longer - without the aching ears afterwards. The best earphones in the world aren't worth much if they can't effectively deliver their sound into your ear canals. Earbud tips are responsible for sealing the deal - literally. The eartips must create a good seal inside the ear canal, both for practical fit and for sound quality. Earbuds that hurt or won't stay in your ears just won't work. And earbuds that don't fit correctly also can't create a good acoustic seal. That seal is what is responsible for keeping music in and external noise out. Comply tips provide an excellent seal against noise. It's so good, in fact, that they call these Noise Isolating Tips. When external noise can't enter the ear, it can't interfere with the sound coming through the earphones and into your ear canals. This sound isolation makes a significant improvement to the audio quality you hear. With the outside noise sealed out, you may pick up on auditory details in your favorite songs that you've never noticed before. And the ambient noise - whether it's a loud commute, noisy neighbors, roaring traffic, or chattering co-workers - gets blocked out. Using these noise isolating tips, you can relax and enjoy the very best sound quality your earphones can produce. Let the world fade into the background, so you can focus on what you actually want to be hearing. You don't have to depend on one-size-fits-all tips to get the right fit for your unique ears. Unfortunately, improperly sized ear tips can ruin an otherwise great set of earphones. If the tips are too large, they can exert unwanted pressure on the ear canals, becoming uncomfortable after just a few minutes. But if they are too small, they can't create a good acoustic seal, so sound quality suffers, and they may fall right out of your ears! Many earbuds come with just one set of tips, and if they don't fit comfortably or create a good seal against sound, you're out of luck. Everyone's ear canals are different, and Comply knows that. With three sizes of Comply T-200 tips to choose from, you can get the great fit you need.